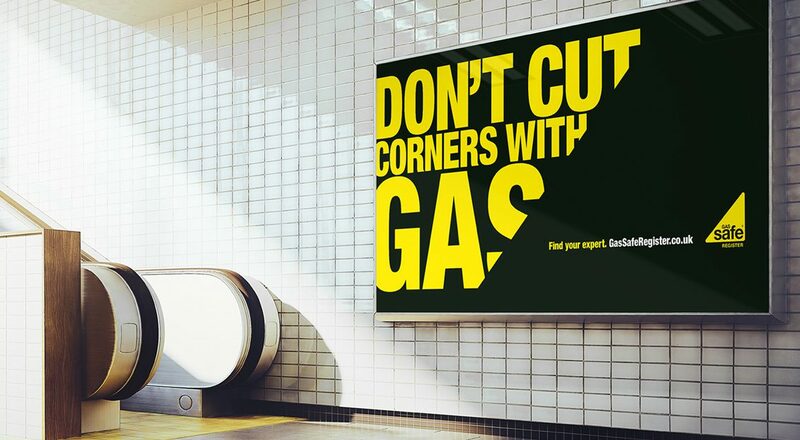 Gas Safe Register have worked with The Team to create a series of black and yellow posters, billboards and digital adverts to urger customers to take gas safety seriously. 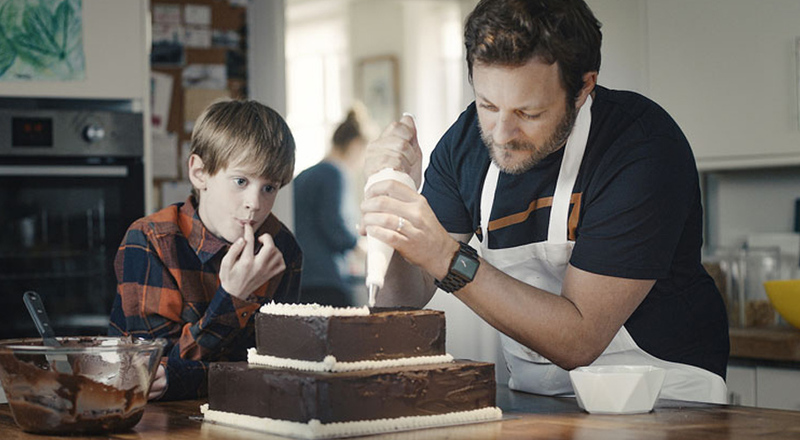 The campaign that urges people not to “cut corners” has been launched nationally. The Gas Safe Register is the official national registration body that gas engineers and plumbers must be listed on and adhere to to “work safely and legally” on gas appliances and equipment. The national campaign that takes in billboards, posters on transport services, digital adverts, national press ads and a TV advert, hopes to raise awareness of the register when customers are searching for an engineer and to bring to the forefront the potential consequences of not taking gas safety seriously. 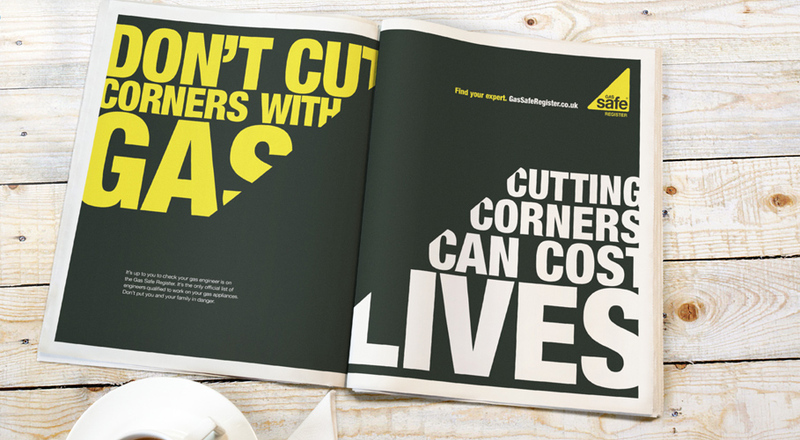 The phrase “don’t cut corners with gas” appears in the top left corner of print and digital posters, with “cutting corners can cost lives” appearing in the bottom right corner as a secondary tagline. Senior designer at The Team, Simon Mannering says the studio was drawn to the “immediacy” of the slogan and “how straight forward it was”. “We wanted to get across that idea that personal recommendations for dodgy do-it-yourself (DIY) can cost your dearly. We didn’t want to just tell people about the register, we wanted to link it back to personal behaviour,” says Mannering. To emphasise the danger associated with gas the design team used contrasting colours, with bright yellow and white set against a black background, picked specifically to “communicate danger”. Mannering says that the condensed Helvetica typeface has been used as it is “urgent and immediate”. Carefully placed words have been cut at a 45-degree angle, which Mannering says creates a “tension” that “stays with you”. 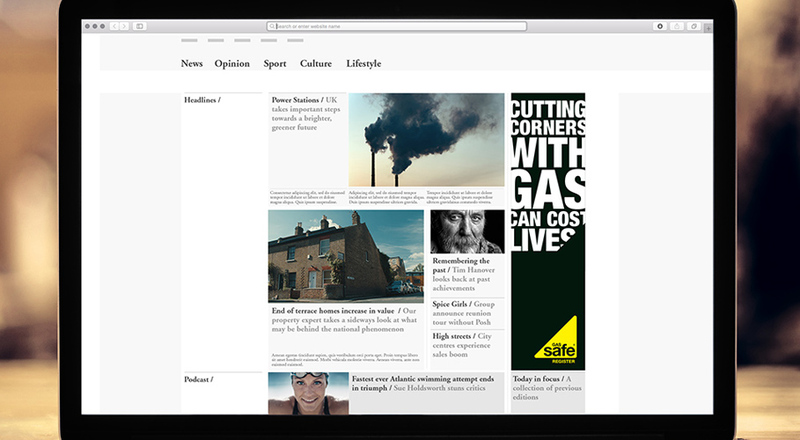 The campaign also intends to “reinforce the brand”, says Mannering, which sees the words “Gas Safe” inside a bright yellow triangle, set in black, with “register” directly underneath it in yellow as its existing logo. 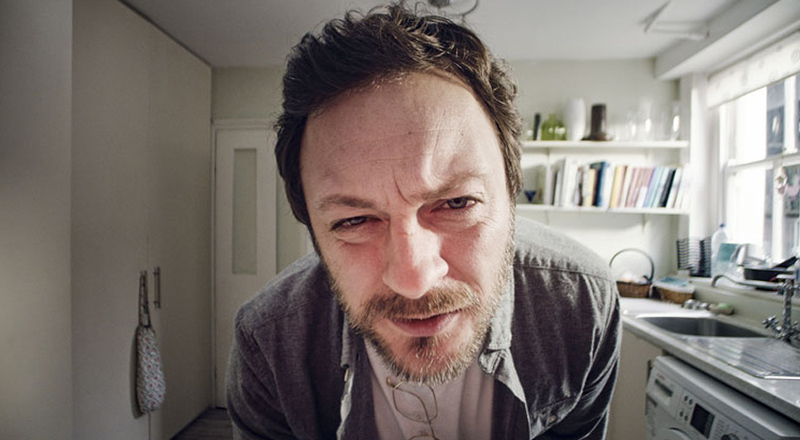 The TV campaign is fronted by a young boy talking about his dad, whose name is Jack Corner, and is “obsessed with corners, but never cuts them – especially when it comes to gas safety”. Dad Jack is seen having a kick about with his son and taking part in other activities, when he notices a problem with the gas, before looking serious and turning to the Gas Safe Register for help. With the difference in approaches between the TV and the print and poster campaign, Mannering says it is important to “customise”. “It gave us an opportunity to add some soft along with the hard. We created the character of Jack, someone you can trust. It is creating that humanity, something you can identify with, which is something you can’t get with a poster. So it is something warm and [the print campaign is] something quite cutting,” says Mannering. The print and poster campaigns are image-free, because Mannering says that The Team were able to create a “striking” and “impactful” design with type alone, while photography and graphics may have “compromised the message”. Mannering did however say that now Jack has been established in the TV advert, he may be used in other marketing in the future.